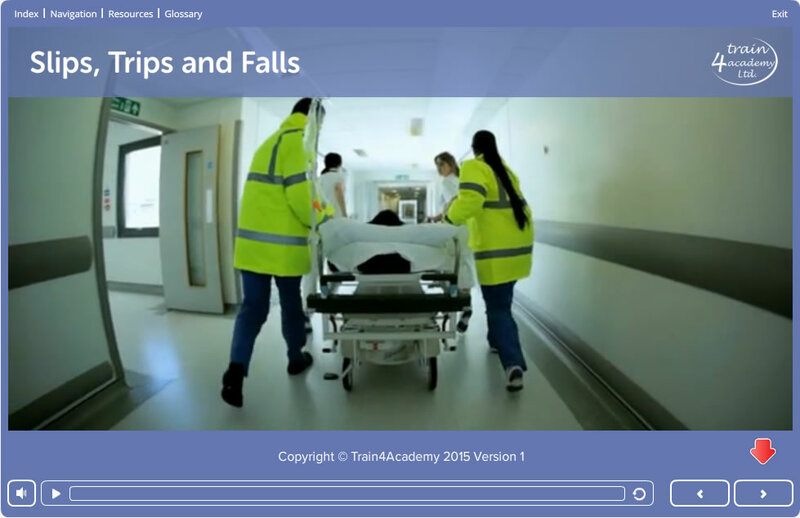 This Slips, Trips and Falls Training course (understanding) is ideal for the learner to complete whilst they're on their induction training. They will gain knowledge in effective risk assessment to meet legal requirements. 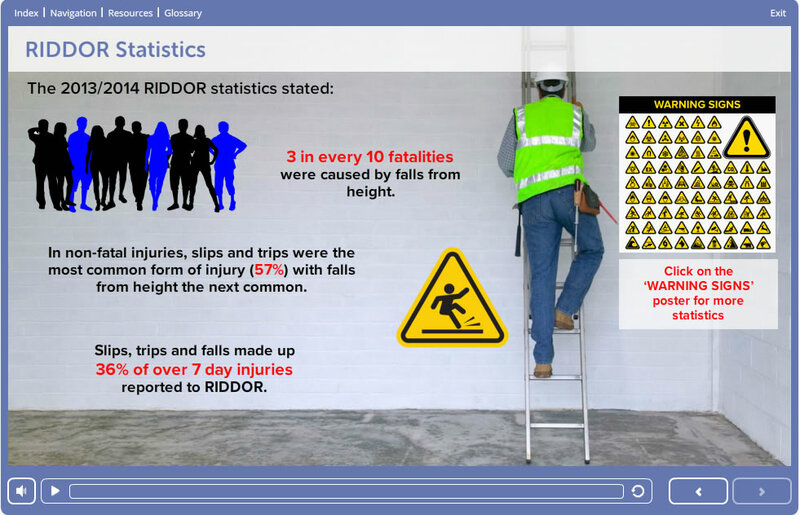 According to HSE accidents statistics slips, trips & falls accounted for more a third (36%) of employee injuries, 59% of specific injuries and 29% of over seven-day injuries. This represents massive losses to U.K. businesses not to mention the human suffering involved with those injured. These injuries can in the main be avoided, if people take a little care, insure workplaces are clean and hazard free and adopt "see it, sort it" attitude. This general awareness can be created within workplaces and training plays a massive part in creating this awareness. This course is simple and engaging and is basic training for all employees particularily at induction. Slips, trips and falls training should be undertaken by any employee during their induction training. 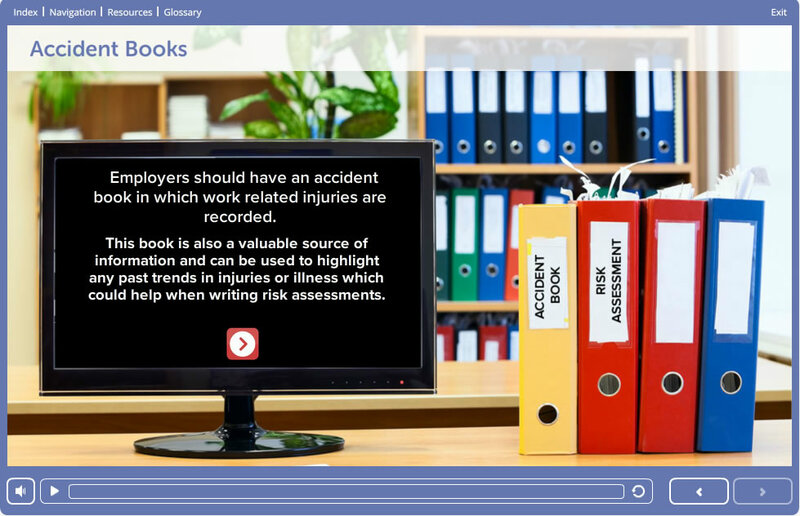 The aim of the online Slips, Trips and Falls Training course is to give a good level of knowledge relating to understanding the importance of effective risk assessment writing and implementing in the workplace. It explain show to produce a quality risk assessment document, which will be practical and meet all the necessary legal requirements. On successful completion of the online course assessment, the candidate will be able to print/save their Slips, Trips and Falls Training certificate. In addition to this, an e.mail is sent to the candidate containing a link to the certificate.